Bill Simmons is back. The Sports Guy’s post-Grantland project, The Ringer, launched today. Although the site has had a social media presence for a few weeks (and Simmons’ now-eponymous podcast returned before that), action really got underway this morning, when Simmons publicly announced a number of the new website’s hires, and continued this afternoon, when he released the site’s first email newsletter. After that comes a Game of Thrones season preview, because this is the internet, after all, and the newsletter closes with a list of the three best-dressed people on Billions, which I just used Google to learn is another television show. If The Ringer is reminding you of Grantland, that could be because of the substantial overlap in the two sites’ subject areas– basketball and premium-network television– and staff– including Katie Baker, Jason Concepcion (@netw3rk), and Brian Curtis. Tracking the similarities between The Ringer and Grantland will be both easy and less interesting than noting the differences, which are what could show us what, if anything, Simmons learned from his last venture. We’ll check back in once things have been up and running for a little while. In the meantime, here’s hoping BS can bring the following Grantland alums back into the fold: Brian Phillips, Rembert Browne, Mark Titus, Louisa Thomas, Charles Pierce, Chuck Klosterman, and Norm Macdonald. In their second game of the season, the Michigan State Spartans jumped out to an early 10-0 lead and never trailed the top-ranked Kentucky Wildcats en route to a four-point win, 78-74. 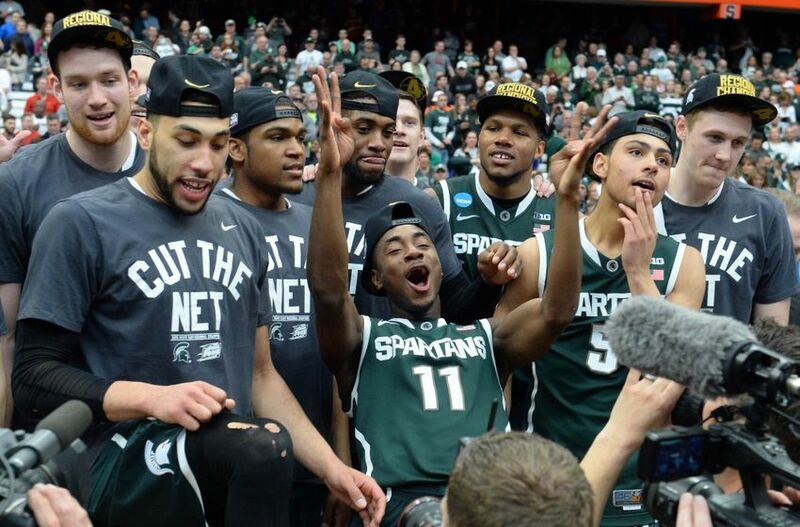 For the most part, MSU looked like a typical experienced Tom Izzo team. They were physical, they caused and capitalized on turnovers, they were as effective as ever on scoring on inbound plays, and the team’s designated leaders led. Point guard Keith Appling showed that, from a positional standpoint, this is his team. Adreian Payne showed that he can control a game from any position on the floor. Sophomore and former Big Ten Freshman of the Year Gary Harris showed that he can be an even more complete player than he was last year. (Marcus thinks he can be the National Player of the Year this season.) Branden Dawson is back as a reliable gap-filler. On the other side, Kentucky is a good team that will get even better, perhaps much better, before too long, and games like this, whatever, the outcome only serve to benefit John Calipari’s current project. Julius Randle, in particular, seemed to be everywhere for the Wildcats, especially in the second half, when he scored twenty-three of his twenty-seven points. Randle led all players in scoring and in rebounds, with thirteen. One aspect that Kentucky must improve is its free-throw shooting. They managed to bring their average above 50% thanks in part to plenty of opportunities (thirty-six overall, versus seventeen for Michigan State) to shoot from the line in the second half. Looking forward, the sky may be the limit for young Kentucky, while Michigan State fans have to hope their very good, veteran team hasn’t peaked. For some reason, some people thought that a mere geolocational shift away from the siting of most of my favorite teams would lead to a sudden abandonment of lifelong allegiances. While that idea plainly is ludacris, I’ve always been interested in what’s happening within my immediate locality, so it’s only natural that I would want to xzibit that sort of content in addition to continued addressing of my non-spatially bound interests. These are concepts that can coexist in my mind and on this site, but you don’t have to take my word for it, because there’s photographic evidence of this unity after the jump.